Mamie Leavitt was born June 27, 1878 near the present site of the Salt Lake City Fairgrounds and was the second daughter of John Quincy Leavitt and Cynthia Tryphenia Elmer Leavitt. While as a young child, she moved with her parents to Farmington, Utah, where she met and fell in love with our father, Thomas Wise. Both family's later moved to Garland, where Dad started farming and Mother's father worked for the railroad. Mother and Dad were married November 1, 1898 at Ogden, Utah in a civil ceremony, then 31 years later, on November 22, 1929, they were married in the Logan, Temple. Their first home was the old George Clark home, where Jim and Wallace were born, then they moved to the old Pierce home in North Garland on the corner, which we know as the Butler home. Mary was born here. Later Dad built and moved into the Frank Davis home where Laurence and Lizzie were born. Dad built several homes in Garland, one was the home by Peter Bossess' which has now been torn down and this is where Clara was born. Mother and Dad dedicated their lives to the welfare of their family and their God. Mother's patriarchal blessing promised that if she remained faithful, she and Dad would see the day when their sons would travel and preach the gospel. They remained faithful, and through hard work and sacrifice, supported two sons on missions. Mother also valiant in her efforts in behalf of her church, served many years as a Relief Society teacher. In my entire memory of Mother, I can never remember her speaking a cross word or complaining, no matter how trying or burdensome her days became. She gave of her time and herself unselfishly, many of her days and nights were spent in her neighbor's homes, caring for the sick, weary or the injured. No matter the time of the day or night, she would always go willingly. She was a patient and loving person and had the ability to soothe and quiet those in need. Perhaps one lady, who was very ill, and mother was caring for her, phrased it best when she said, "You know, when others swat a fly in my bedroom they nearly shake me out of my bed, but when Sister Wise does it, the only way I know she's doing it is when I see her raise the fly swatter. " She was always soft spoken and gentle and brought comfort and assurance to those who needed her, and she was loved and appreciated for this service. Mother always held a very deep and abiding faith, many times I've heard her say, “The Lord move., in a mysterious way". She always knew in her heart and held the conviction that things would work out. One example of this was when one of the boys was in the mission field and wrote home asking for some extra money for a new suit. He said if the folks could afford it fine, if not, he would understand and make his old one do. Mother stated simply, "We'll send the money some-way. “ They saved and when the time came to send the money, they didn't have quite enough. Mother said, "Tom, send this much, we’ll get the rest." Dad took the money down to the railroad depot early one morning to catch the early train to send the money. It was so early that there seemed to be no one on the street, but Dad, as he waited for the train, a man who lived some distance away came up to him and said, "How are you today Tom, you're out early. ' Dad said, "I'm fine, " then the man said, 'How is that boy in the mission field getting along? , Dad answered, "Just fine, I’m sending him some money. " The man reached in his pocket and handed Dad some money, saying Here Tom, send him this. " The amount he gave Dad was the amount Dad needed in order to send for the suit. Another time they needed $5 more to send the amount they sent each month. As usual, Mother said "We'll send it in a day or two. On his way to the post office, Dad found a $5 bill folded on the sidewalk. Mother was a person of tremendous compassion and humility. She never turned a soul from her door. In those days there were many tramps, or beggars, who would come to the door and ask for a bite to eat. One day a man knocked on her door and asked Mother for a bite to eat. Mother said, "I have a child with pneumonia and a death in the family, but if you will want a minute, I’ll fix you something. The man spoke gently, "Thank you Lady, you have enough to do, I'll go somewhere else. Mother always felt that she had met one of the three Nephites and was being tested. Mother devoted much time doing temple work. I remember she always kept a suitcase packed and was ready to go at a moment's notice. Many times after being at the temple one day, the next she would suffer with terrible headaches. When asked why she went when she knew she would suffer for it, she replied, “It's well worth it. In addition, she gave freely of her finances for research and genealogy. This is just a brief example of her efforts concerning Temple work. 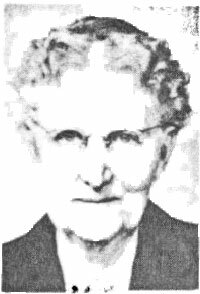 Over the period of time from 1940 to 1943, she did the temple work for 78 families, assisted in sealings for 15 families. From March of '43 to May of '43 she assisted in completing 51 sealings. In 1944 she helped with 81 sealings. Mother possessed a great sense of humor. She always managed a smile, no matter how difficult things were. I remember when I was a child, Mother always whistled around the house. One day she and Dad got on the subject of giving flowers when there was a death. Dad told her when he died he didn't want anyone to buy him flowers, just some tumble weeds would do. Mother spoke up saying, "Now look Tom, if you think we're going to waste all those wild morning glories out there, you are mistaken". Mother was a good housekeeper and a wonderful cook. She canned thousands of quarts of fruit. Many the time I’ve seen her have 15 to 20 bushels of fruit at a time. She always got up in the morning fully dressed, and always wore a pretty starched apron. Her long red hair was always beautifully combed. Dad never had a sister, so Mother took care of Grandpa and Grandma Wise as if she was their own daughter. When they were older and couldn’t be left alone, Dad built them a small home right by his door, so they could still have a home, but Mother and Dad could watch over them. Mother did all their washing, ironing and cleaning. She cooked all their meals and carried them out to them on big trays. This she did for a long time while they were both living. 'When Grandfather passed away, Grandma was so feeble she was unable to do things for herself, Mother took care of her like she was a baby, changing her clothes and her bed several times a day. She had to feed her every meal she ate. She did this until Grandmother passed away six months later. This brief history of Mother was written as we remember her best. Perhaps this isn’t a history at all, but the memories of her that we cherish the most. We remember her not as a person who engaged in many local or civic activities, or as a socially busy or preoccupied person. Instead, we remember her gentleness, her warmth, and her comforting smile. We remember the twinkling eyes and happy laughter. We remember how her hair fell in cascade of soft beautiful waves the length of her back. We remember how she loved life and lived each day in such a way as to reap the fullness of its blessings. There was never a day, that as dusk fell, that Mother couldn't have reflected back on and said to herself, "Mamie, God gave you this day to us~ as you saw fit and you've made him proud. “ Mother died November 30, 1951 with a posterity of 132. We dedicate this tribute to you, Dear Mother of mine. Though it's just a thought, a word and a line. We know your life was not easy nor the path always bright, But your smile, so sweet, turned the darkness to light. You accomplished the things God expected of you. You were wife and companion, and a dear Mother, too. For you brought six children into this life, and taught them to face all of its troubles and strife. I recall that to most everyone that you were called "Aunt Mame. And your hospitality you extended to any who came. . . Your doors were always open, your table always set, for your family, your friends, or someone just met. You were forgiving when folks didn't do as they should, And your merciful eyes saw in each one only good. Your home seemed always with grandchildren filled, Their childlike antics refusing to be stilled. Their happiness there seemed only to reveal That the love in your home they so keenly could feel. We‘re grateful Mother that you taught us life, That we experienced a happiness that overshadowed the strife. We have felt the strength and courage that helped you endure, We have basked in your love so tender and pure. For the great "Mother love" ne'er fades with the time But becomes only more precious and more sublime. You lived a wonderful life, being the best Mother and wife. Days weren't always easy or bright, your smile always made them right . Your mission here was completed and you were called home. And for thirteen long years, Dad guided us alone. Then he too was called to that Heavenly sphere, Because you needed him there, to help you inspire us left here. I'm sure as the angels, in the golden book, entered your name, They put their arms around you and proudly wrote welcome "Aunt Mame.
' And so as life goes, we were destined to part, But you still hold a place here on earth in our hearts. When our souls are troubled and life's burdens we fear, We are calmed and made peaceful by your memory so dear. The pain and the sorrow, the despair fairly flee, As our minds wander back and our thoughts roam free. Back to those days and back to those times, When your arms held us close and helped quiet our minds. Your loving warm lips kissed away our small tears, And as quick as they came, you would vanish our fears. You still serve us Mother as companion and friend, And your love and your wisdom will help us to endure to the end. We feel your influence and our hearts fairly swell, And we know now, as we did then, that all will be well. One day, we too will our summons receive, As our loved ones we leave, they must surely grieve. But truly our souls will abound with joys untold, As we join you dear Mother and Dad, as one of the fold.